Located rather close to some key destination is the scenic and breathtaking Keoladeo National Park. It is among the ideal places to travel this season, with many migratory birds awaiting your visit. Located at a distance of 184 km from Delhi, the National Park can even constitute for a weekend getaway. It is also located in close proximity to major tourist areas in the region such as Mathura (39 km), Agra (56 km) and Jaipur (176 km). Located in the once princely state of Bharatpur, the Keoladeo National Park is so richly endowed with natural beauty and avian life that it was once a hunting ground for the erstwhile kings and the British. Thankfully, today, this protected area that has been declared a World Heritage Site is a safe haven for bird life and a must-visit for all outdoor enthusiasts. Enjoy one of the best destinations to travel this season. The Keoladeo National Park is among the most popular bird watching sites in not just the country, but in fact, the whole of Asia! Over a lakh visitors are known to visit the park in the course of a year, they include a whole array of people ranging from foreign tourists to school children. It is indeed a great way to spend a weekend in calm or as an interesting stopover on trip to Agra or Rajasthan. The green and inviting vistas of the Bharatpur Park. So if you are wondering what else you can do besides soak in the natural beauty, cycling is an answer for those of you eager to experience the outdoors. You can rent cycles and take a leisurely ride through the park, only pausing to admire the magnificent birds and maybe even capture them on film for a stunning shot! If you are not too comfortable cycling, then you can take a cycle-rikshaw through the park. The park even offers small trekking trails that can be explored. 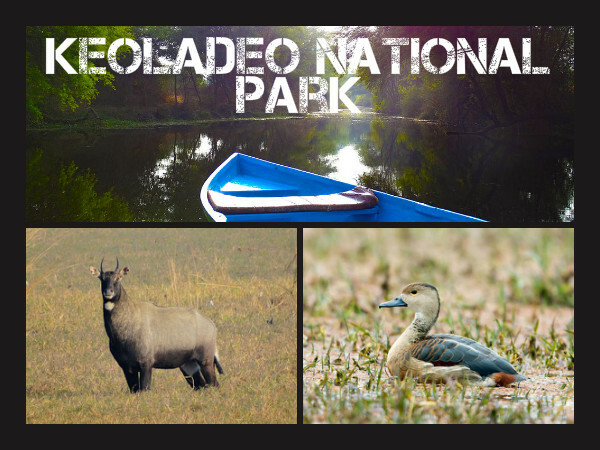 Viewing the best of Keoladeo National Park on a charming boat ride. The stretch beyond the initial 3.5 km path is where you are sure to find the undisturbed gathering of birds and wildlife, so at the Keoladeo National Park, the more you explore the more you shall find! Of course make sure you do know a thing or two about birds, otherwise it is recommended you take the cycle-rikshaw as he will double up as your guide. Convenient, right? Those of you who plan to take your kids on this wonderful trip should be aware that in the early morning and evening boating trips are also available. A sure method for the entire family to enjoy the best of Keoladeo National Park. A unique wildlife park that is primarily known for its vast variety of birds, the Keoladeo National Park has over 380 types of birds, both domestic and migratory types. Ideally located in the Gangetic Plain, the park sees both waterfowls and land birds. You can feast your eyes to the sights of Cormorant, Open Billed Stork, Oriental Ibis, Sarus Crane, Indian Grey Hornbill, Painted Stork, etc to name a few. Among the land animals you are sure to be mesmerised by majestic sights of the Nilgai, Chital deer, Sambar and a variety of other mammals. The National Park also has an interesting variety of reptile and aquatic life. Exotic bird life at the Park. An entire day can be spent easily admiring and enjoying the beauty of the Keoladeo National Park. However, if you are hungry for more, Bharatpur has some noteworthy attractions you must-visit. Take yourself on a short journey from the park to the Bharatpur Government Museum. If you are of the artistic inclination, a trip to the lovely Bharatpur Palace is a must, especially worth visiting for the stunning confluence of Mughal and Rajput styles of architecture. Other attractions include; the Lohagarh Fort and the Deeg Palace. Anytime from October onwards is good to travel to the Keoladeo National park. However the best season is when the migratory birds arrive in December-February. Spotting the majestic Neelgai at the National Park. By Road: Several National and State Highways connect Bharatpur to the many cities and tourist destinations around Delhi and Rajasthan. You can opt for NH-2 if travelling from Delhi, the NH-11 and SH-44 if travelling from Jaipur and Nh-11 if travelling from Agra. By Rail: The Bharatpur Railway Station is located at a short distance from the National Park and well-connected by regular trains to all neighbouring towns and cities. By Air: Agra, located at a distance of 56 km is the nearest airport. A lovely sighting of the Eurasian Spoonbill at the Keoladeo National Park. Early morning presents one of the best times to view the birds, so if you are planning to reach here early, carry some warm clothes as the weather can be rather chilly! Carry a cap and water. To make sure you enjoy the sights thoroughly, carry binoculars and of course don't forget your camera. It is a protected region and there is a constant struggle to maintain the ecology and bio-diversity of the Park. Hence, do your bit and refrain from polluting the area or disturbing the wildlife. A Whistling Duck spotted within the Park premises.